Add a stylish edge to your garden pathway or landscaping with the Panacea Boulevard Quatrefoil Border Fence. This eye-catching fence brings an elegant look to your garden or yard in moments, thanks to its black, square frame and intricate scrollwork. A rectangular, copper colored metal panel occupies the center of this fencing, highlighting the scrollwork for added style and color. These curves contrast the square bar construction, while the copper and black color scheme lends a classic finish. The 6.25" long legs insert into your soil easily, and the metal throughout ensures a durable border. Define your garden edge in a stylish new way with this Boulevard Quatrefoil Border Fence. 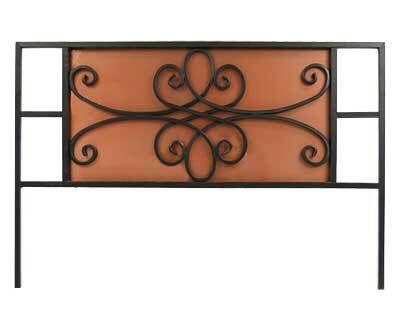 Note: This case pack includes 12 of the Panacea Boulevard Quatrefoil Border Fence Sections.